With quality nutrition from the source comes a better life. Owned 100% by a local group of passionate dairy farmers committed to the highest quality standards and devoted to animal welfare and environmental stewardship. 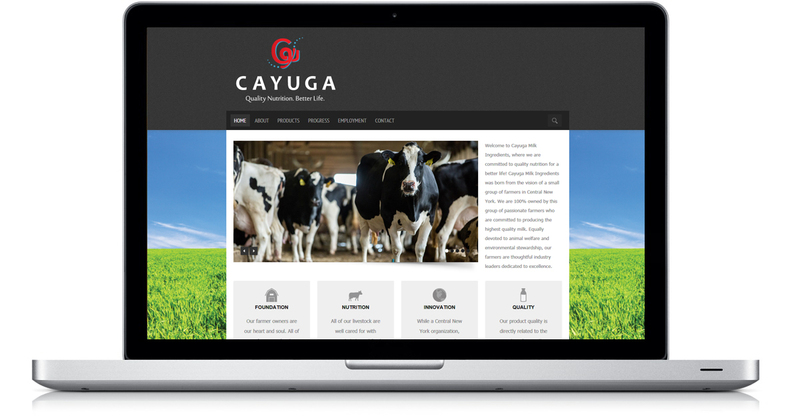 Cayuga Milk Ingredients was still constructing its state-of-the-art facility when its executives sought the creative branding expertise of Crème della Crème Copywriting & Communication to design the company’s brand logo, and write and design their easy-to-navigate website. The Cayuga Milk Ingredients website has been live since 2013 and remains the go-to information center for details about the company’s milk ingredient products, employment opportunities, and more.